China appears to have largely completed major construction of military infrastructure on artificial islands it has built in the South China Sea and can now deploy combat planes and other military hardware there at any time, a U.S. think tank said on Monday. The Asia Maritime Transparency Initiative (AMTI), part of Washington's Center for Strategic and International Studies, said the work on Fiery Cross, Subi and Mischief Reefs in the Spratly Islands included naval, air, radar and defensive facilities. 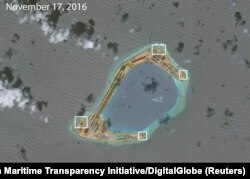 A satellite image shows what CSIS Asia Maritime Transparency Initiative says appears to be anti-aircraft guns and what are likely to be close-in weapons systems (CIWS) on the artificial island Subi Reef in the South China Sea. The think tank cited satellite images taken this month, which its director, Greg Poling, said showed new radar antennas on Fiery Cross and Subi. A Pentagon spokesman, Commander Gary Ross, declined to comment on the specifics of the AMTI report, saying it was not the Defense Department's practice to comment on intelligence. AMTI said China's three air bases in the Spratlys and another on Woody Island in the Paracel chain further north would allow its military aircraft to operate over nearly the entire South China Sea, a key global trade route that Beijing claims most of. The think tank said advanced surveillance and early-warning radar facilities at Fiery Cross, Subi, and Cuarteron Reefs, as well as Woody Island, and smaller facilities elsewhere gave it similar radar coverage. 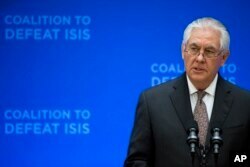 Secretary of State Rex Tillerson speaks at the Meeting of the Ministers of the Global Coalition on the Defeat of ISIS, March 22, 2017, at the State Department in Washington. In his Senate confirmation hearing in January, new U.S. Secretary of State Rex Tillerson angered China by saying it should be denied access to islands it had built up in the South China Sea. He subsequently softened his language, saying that in the event of an unspecified “contingency,” the United States and its allies “must be capable of limiting China's access to and use of” those islands to pose a threat. In recent years, the United States has conducted a series of what it calls freedom-of-navigation operations in the South China Sea, raising tensions with Beijing.